From our myths, to our funny pages, to our movies, Thor has been around a long time. With so many years that have passed and so many stories told, there are some facts that just aren’t as popular or popularized as others. So, in no particular order, I’m going to spout out some obscure Thor facts that you might not have known. Along with many other heroes, Thor’s first comic book appearance was a part of an anthology series. Journey Into Mystery started out as a horror anthology, then focused more on science fiction and giant monsters. Thor debuted in issue #83 and soon became the star of the book. 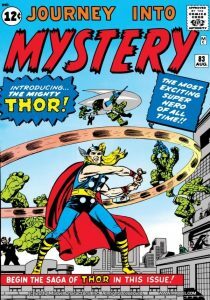 The book was renamed to Thor for issue #126. Mjolnir is definitely one of the coolest weapons in fiction, but before Thor was “worthy,” he was still a total badass. He usually wielded an uru battle axe named Jarnbjorn. He even blessed it with his own blood, increasing its power so that he could defeat Apocalypse, cutting through his crazy celestial armor. On top of that, Thor sometimes sports a pretty sweet belt named Megingjord. Enchanted by Odin, this belt doubles Thor’s already considerable strength and stamina. Thor has two huge super strong pet goats named Toothgnasher and Toothgrinder. They can fly and pull his chariot as he rides through space! So Mjolnir can fly, but Thor cannot. In order to fly Thor has to swing Mjolnir really fast and then toss it as hard as he can, while hanging on tight. Thor and his Asgardian brethren are not truly immortal. Unlike their fellow pantheon the Olympians, Asgardians don’t just live forever, but have to consume magic golden apples to maintain their youth and vigor. “An apple a day, keeps death at bay,” is something no one has said ever. Frigga (or Freyja), played by Rene Russo in the film series, is actually Thor’s step-mom. Odin wanted to create a warrior that had great power in both Asgard and Midgard (Earth), so naturally he mated with Mother Nature herself. Thor’s birth mother is the elder god Gaea (although she was going by Jord at the time. After baby Thor was weaned, Odin took him to Asgard to be raised by himself and his wife Frigga, hoping that Thor would be powerful enough to end the cycle of Ragnarok forever. 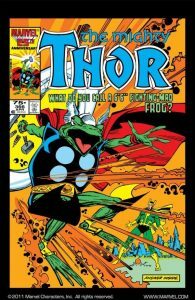 During Walt Simonson’s run on the character, Loki turned the mighty Thor into a mighty frog. He then led a militia of frogs to fight an army of rats in Central Park. The rats were trying to poison New York’s water supply using lots of rat poison. 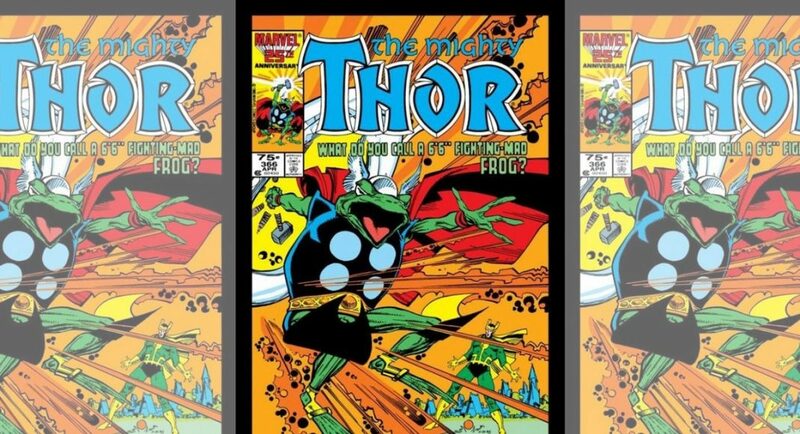 Luckily Frog Thor stopped the rodents and made it back to Asgard to stop Loki’s amphibious scheme.